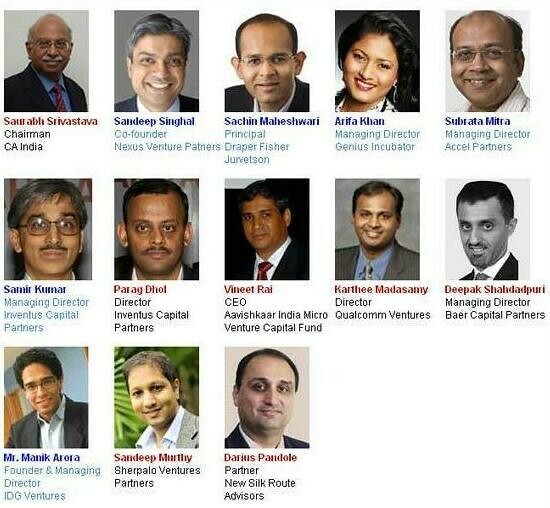 Entrepreneur Investor Meet - for Indias hottest startups, VCs angel investors. We believe in the power of entrepreneurship! If you have an entrepreneurial dream, come let us help you bring it to life! What can Enterpreneurs look forward to from this event? This is an unmissable opportunity for Startups to pitch to investors raise funding, meet network with other entrepreneurially minded individuals, recruit co-founders and team members, go away inspired to take your startups to newer heights! We are on to building the entrepreneur-investor eco-system in India. If you have anything to contribute - capital, ideas, expertise, mentoring, skills, connections, business opportunities, we would love to have you with us. You will get first access to the best of startups & teams. Nurture entrepreneurship! Come, be a part of this India building exercise! Upto 10 pre-selected startups will pitch to investors on July 26th. Please email your pitches to destinationindia@geniusincubator.com by July 10th to be considered for the Showcase. Pre-selected founders will make 15 minute presentations to VCs/ angel investors and on the spot feedback provided. Your pitch will be reviewed by our selection committee and you will be notified of your selection to Destination India 2012 by July 15th 2012. Selected founders will be invited to a day of pitching and networking with investors at Sofitel, Mumbai India. Srinivas is currently a Managing Partner at Milestone Religare Investment Advisors. He was formerly a Director with UTI Ventures and with IL&FS Ivestment Managers. Sanjay has over 15 years of entrepreneurial, consulting and operations experience. He spent 7 years between PwC Consulting and IBM Global Services' Silicon Valley offices, working closely with HP/ Compaq, Sun Microsystems, Intel and AT&T. Before He co founded and ran a Legal Process Outsourcing (LPO) company. Sanjay has been a member of the Mumbai Angels since 2006. He has made 8 investments across mobile, online travel, software, healthcare. Sanjay was an early investor in InMobi (formerly mKhoj), one of India's best known angel-funded success stories. In the US, Sanjay was a Principal with IBM Global Services and earlier a Consultant with PwC in a similar role. Sanjay supported the initial growth of Kanbay which had a successful IPO on the Nasdaq in '04, and was then acquired by Cap Gemini Ernst & Young for $1.25 billion in 2006. Sanjay brings a strong global network of investors, entrepreneurs and professionals across the US, South East Asia and India. He is passionate about helping entrepreneurs and is active in associations including TiE (where he is a Charter Member), Mumbai Angels, and The Churchill Club. Sanjay is an engineer from BITS, Pilani and holds an MBA from UCLA's Anderson School of Graduate Management. Deepak has been associated with Intel Capital as an Investment Director since 2010. Armed with multi-country exposure across multiple organisations, he has a full-time professional experience of over 15 years in private equity/venture capital, treasury, and controllership. During his journey with Intel Capital, Deepak was/is responsible for many successful investments including Sasken, Tejas Networks, Future Software, Elind, Enmail, Consign technologies, Career Launcher, Omnesys, Dealsandyou, Fashionanyou, Telibrahma. Prior to this, Deepak was the Revenue & Strategic Controller for Intel Asia-Pacific where he supported the revenue management for the Asia Region. He has been credited with spearheading many successful investments inclusive of Sasken, Tejas Networks, Future Software, Elind, Enmail, Consign technologies, Career Launcher, Omnesys, Dealsandyou, Fashionanyou, Telibrahma, among others during his journey with Intel. He is also an invitee on the Board of Tejas Networks, Telibrahma, Omnesys. Deepak holds a B.Tech from Indian Institute of Technology (IIT), Mumbai and an MBA and MS (Finance) from the University of Maryland. Anand is the founder, Chairman and CEO of Rave Technologies. Since Rave's inception in 1987, Anand has guided Rave from a small company to a medium sized organization providing software solutions with offices across Europe, USA and India. Anand started his career in designing controller chips with Advanced Micro Devices in Silicon Valley as a Senior Systems Engineer. After two years at AMD, he joined a start-up company, Clarity Systems, Inc., as an Applications Engineer developing CAD tools for VLSI semiconductor devices. Upon Anand's return from the US, he founded Rave Technologies. Anand holds both Bachelors and Masters degrees in Electrical Engineering from Cornell University, graduating with distinction. Sasha Mirchandani is the founder and a part of the investment team at Kae Capital. He is also the Co-founder of Mumbai Angels and previously was with Blue Run Ventures as Managing Director for the India operations. The Kae Capital investment team consists of professionals that bring a combination of experience from the venture capital, consulting and operational roles which put together gives an optimum bandwidth to analyse potential investment opportunities and help grow the investee companies. We have a well-regarded board of advisers who are at the forefront of their respective industries and bring in several years of invaluable experience and industry connections. Our investment team works closely with the advisory board members in a disciplined and organized manner to achieve the best practices for investing. Raj Chinai has co-founded and launched Harvard Business School Angels of India (HBSAI), an angel investing organization, in collaboration with Harvard University. The network will support Harvard’s mission to “educate leaders who make a difference in the world,” and it will focus on technology and technology-enabled startups by investing $250,000 (U.S.) to $500,000 in each business. Raj completed his master’s degree from Harvard in 2004 . Mr. Chinai, who was earlier working with SVB India Capital Partners, is a principal at the early stage venture capital firm IndoUS Venture Partners.